Product prices and availability are accurate as of 2019-04-17 18:25:14 BST and are subject to change. Any price and availability information displayed on http://www.amazon.co.uk/ at the time of purchase will apply to the purchase of this product. 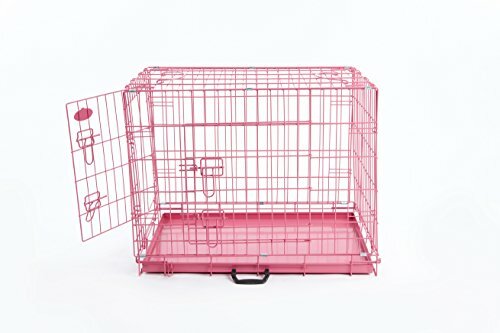 This offer is for a new foldable heavy duty dog cage with 2 doors and metal removable tray for easy cleaning in Pink. Please choose correct size cage for your pet. It should be large enough to enable pet to stand and turn around. XL Cage 42" long x 28" wide x 31" high 106cm long x 71cm wide x 77cm high Door has 2 sliding bolts Airedale Terrier, Australian Shepherd, Bearded Collie, Belgian Malinois, Belgian Sheepdog, Belgian Tervuren, Border Collie, Boxer, Chesapeake Bay Retriever, Chow Chow, Dalmatian, Doberman, Golden Retriever, Ibizn Hound, Labrador Retriever, Normal Poodle, Saluki, Standard Poodle, Standard Schnauzer, Vizsla Weimaraner Please read all instructions and recommendations carefully before using pet cage. You must train your pet before leaving them alone. All dogs/puppies instinctively look for their own den to call home. With proper training your dog/puppy will look upon their cage as their den. Portable - can take with you on holiday, providing a mobile home for your dog. Cage Location Select an area of the house which has frequent activity such as TV or family room. The pet should not feel isolated or alone when using the cage. 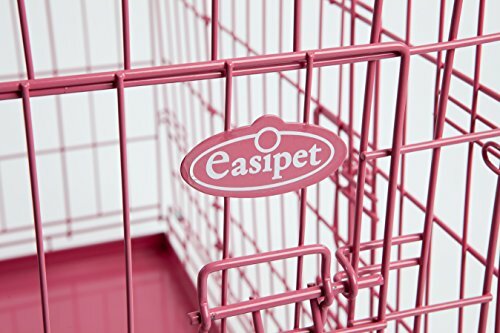 Cage Training It is important that your pet associates the cage with comfort and safety. Do not rush the training process and ensure that pet is happy before closing door or leaving alone for any period of time. 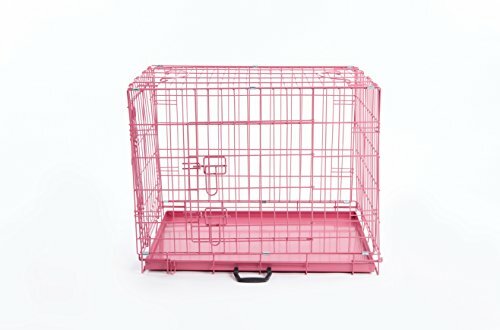 Ensure that pet has already "relieved" itself before using cage. Put comfortable bedding on crate floor,not leaving space for toilet activities. Do not force pet inside cage, or use cage as punishment. Once pet is happy using cage then start to close door for short periods, extending periods with door closed so that pet is used to cage door being shut while you are in the house. When pet is comfortable for extended periods with door closed you can leave pet for short periods, gradually increasing time spent away If leaving for more than 1 hour leave water for the pet. Do not keep pet caged all day and all night. 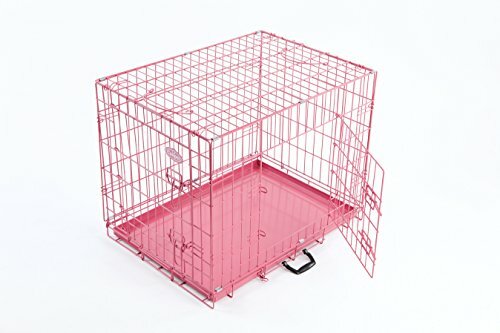 Foldable heavy duty dog cage in Pink XL 42" cage (42" long x 28" wide x 31" high) 106cm long x 71cm wide x 77cm high (all measurements are approximate) Door has 2 sliding bolts for security Portable - can take with you on journeys or holiday.